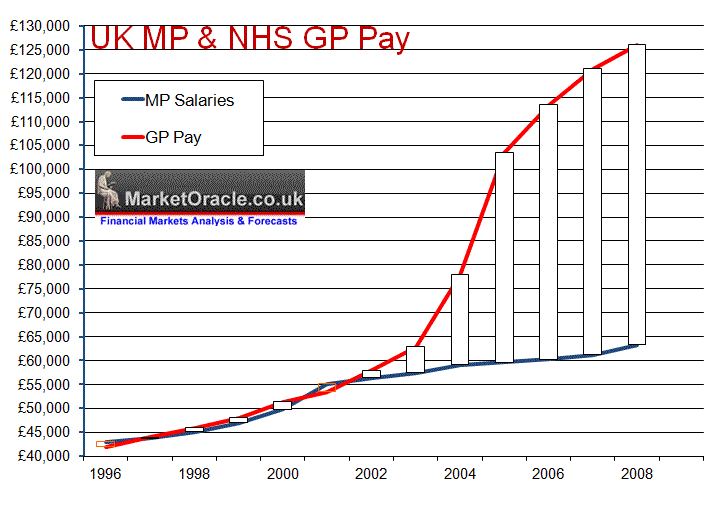 The ConLib government proposes to scale back the role of strategic health authorities and local trusts that currently act as weak checks and balances on the level of GP performance, though as illustrated in the recent article (NHS Choose Your GP Consultation ) tend to waste years on public consultations, without actually acting to make healthcare improving implementations, still did provide for some weak pressure on GP's to attempt to perform. The National Audit Office recently reported a picture of a widening gap in life expectancy between affluent and deprived areas of the country of more than 10 years as a consequence of GP's in deprived areas effectively ignoring the symptoms of their poor patients which results in less resources being plowed into high disease prevalence deprived areas in favour of more resources being directed to low disease prevalence affluent areas which reflects a failure of the GP's to do their jobs. The country is currently running an annual £156 billion budget deficit i.e. the government spends £156 billion a YEAR more than it earns in revenue which is contributing to towards igniting Britains inflationary debt spiral, that risks accelerating trend towards an hyper inflationary bust leaving savers with worthless paper and the economy in ruins, i.e. bankrupt unless urgent action is taken to bridge the gap. The NHS budget under Labour has grown from £40 billion in 1997 to £121 billion for the last financial year. NHS budgets increasing in line with inflation (CPI) would have seen the budget under a Conservative regime rise to stand at £51.6 billion, and probably nearer £60 billion to allow for an ageing population. So the Labour government is in effect spending an extra £60 billion a year, more than double that which the Conservative would be spending on the NHS. Against this extra spending instead of Brit's experiencing the impact from effectively paying for TWO NHS's, the NHS is experiencing year in year out loss in productivity, i.e. the more the government spends on the NHS the LESS output the NHS delivers as more tax payer funds disappear into the NHS black hole. In theory this suggests that the NHS budget could in-effect be halved to £60 billion and still deliver a functional health service that the the country can afford. Off course that is not going to happen, but still a mere 10% cut in the NHS budget would contribute some £12 billion of annual savings. The government's annual budget deficit is running at £156 billion a year or at 23% of the total budget i.e. the the governments total revenues are £520 billion against estimated expenditure of £676 billion, hence a deficit of £156 billion added to the national debt known as the Public Sector Net Debt (PSND) currently standing at about £850 billion, though excluding the hidden tax payer liabilities that extend to several more trillions of pounds. Nevertheless £850 billion of debt costs about £35 billion in interest per year to service, as the debt grows so does the cost of servicing the debt, more so as the supply of government bonds increases then so will the market demand ever higher interest rates to buy this flood of debt which illustrates why running anywhere near an £156 billion annual budget deficit is NOT sustainable that the ConLIb government intends to reduce to £20 billion by 2015-16, though as the in depth analysis (29 Jun 2010 - UK ConLib Government to Use INFLATION Stealth Tax to Erode Value of Public Debt ) pointed out is unlikely to be achieved because the ConLib government has tied one arm behind its back by stating that they will continue to increase the two largest areas of government spending, the NHS and Pensions which amount to 1/3rd of total government spending. The only answer to the NHS GP and Hospital delivery crisis is in greater competition between surgeries and hospitals which ultimately means privatisation, as the existing system of no real competition means the incompetent are rewarded with more resources in the face of inability to delivery whilst those that excel are punished with less resources so as to pull all services down towards the under performing mean. The only way excellence can be rewarded and act is the goal to be achieved is if competition drives out the incompetent GP surgeries as they lose patients and resources to the better run GP surgeries which can only happen in a private system of healthcare delivery, where patients would in effect be handed NHS credit cards to enable them to buy healthcare at ANY health facility whether NHS run or private. Given the actual performance of the NHS, I would imagine that closing 20% of the worst performing NHS Hospitals and GP Surgeries would result in IMPROVED life expectancy for patients as well as contributing £24 billion of annual savings to help towards reducing the £156 billion annual budget deficit.